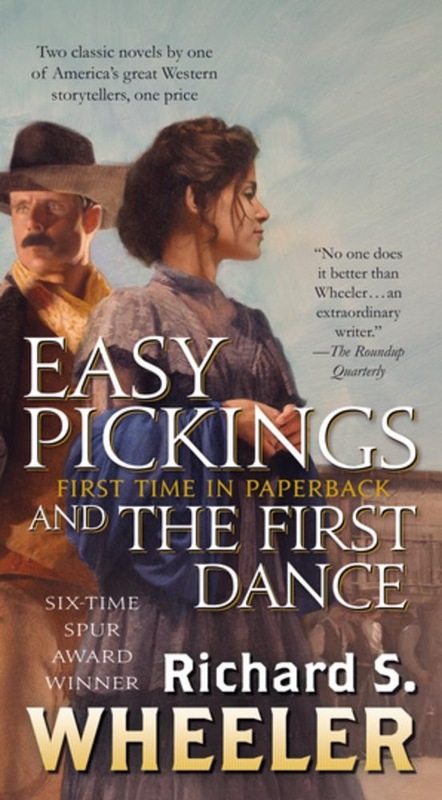 From six-time Spur Award-winning author, Richard S. Wheeler, two tales of strength in the face of adversity- Easy Pickings and The First Dance at one low price. Easy Pickings Life hasn’t always been easy for March and Kermit McPhee, but things are finally looking up. March has given birth to a healthy son, and Kermit is blasting his way along a good seam of ore in their small gold mine. Then Kermit is crushed by a cave-in. Within days of his death, the crooks of Marysville, Montana, are at March’s door, eager to get their hands on the mine. Her refusal sets off a terrible chain of events. March’s baby boy is killed, her home burned to the ground. Terrified and threatened, targeted by the wealthy and powerful, March fights back every way she can. Still, she must ask herself whether it is worth it; whether a gold mine, or wealth of any sort, should be defended at such a price. The First Dance Miles City, Montana, 1885. Barnaby Skye's mixed-blood son, Dirk, marries a Métis girl, Therese, but his position as a civilian translator for the US Army threatens to shatter their union. When Dirk is forced to serve in the brutal campaign between Montana's disgruntled cattle ranchers and the native Métis people, a distraught Therese flees—on their wedding night. Though they have been torn apart, Therese and Dirk share a powerful bond and a common cause: the desire to help the displaced Métis find a home. Their love pulls them toward reconciliation and new hope for Therese's people. This edition of the book is the deluxe, tall rack mass market paperback. At the Publisher's request, this title is being sold without Digital Rights Management Software (DRM) applied. Acquista Easy Pickings and The First Dance in Epub: dopo aver letto l’ebook Easy Pickings and The First Dance di Richard S. Wheeler ti invitiamo a lasciarci una Recensione qui sotto: sarà utile agli utenti che non abbiano ancora letto questo libro e che vogliano avere delle opinioni altrui. L’opinione su di un libro è molto soggettiva e per questo leggere eventuali recensioni negative non ci dovrà frenare dall’acquisto, anzi dovrà spingerci ad acquistare il libro in fretta per poter dire la nostra ed eventualmente smentire quanto commentato da altri, contribuendo ad arricchire più possibile i commenti e dare sempre più spunti di confronto al pubblico online.